Our stock line includes many types of apparel displays that are designed to merchandise a wide range of apparel products. We offer 1-sided, 2-sided and 4-sided fixtures, most of which are constructed using a combination of metal and wood. All of our apparel fixtures feature knock-down construction which helps reduce shipping and storage costs. 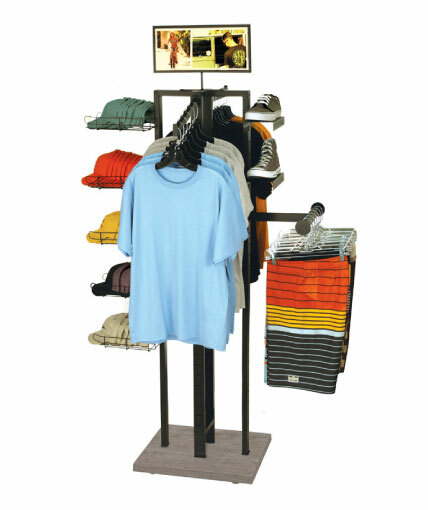 Aside from our popular 4-sided mobile t-shirt cubbie display, our apparel fixtures either have slotted tube frames or grid panels, both of which allow for adjustability of the fixture accessories that are available to be purchased with these units. Our accessories include shelves, hooks, waterfall arms, straight-outs, jet rails, cap pockets, shoe shelves, and sign holders. Our apparel displays are highly configurable. Select one or more of our accessories to merchandise these fixtures to achieve maximum sales for your product line. 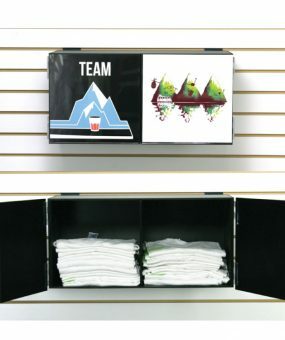 Our stock apparel displays are an ideal solution for immediate merchandising program needs. Our fixtures fit well in many different types of retail environments, including clothing stores, department stores, boutiques, sporting goods stores, outdoor retailer stores, surf shops, department stores, and other specialty retailers. They can accommodate a variety of men’s and women’s apparel items and are affordable for almost every budget. If you don’t see a stock apparel display that works for you, let us know, and we can design a custom apparel display that meets your exact requirements. Click here to view our different types of Apparel Displays. Rich LTD. in Oceanside also offers T-shirt display cubbies and many merchandising solutions!